Nondestructively apply and edit color adjustments. Adjust colors using all the detail your camera can capture. Save and share the adjustment combinations you create. No unwanted artifacts, no matter how extreme your color changes. See a quick snapshot of all the colors and tones in your image. Easily improve the lighting in your shots. Quickly improve brightness, contrast, and color. Adjust lighting and color with incredible precision. Easily adjust precise color ranges in your images. Manually or automatically adjust color temperature. Balance all the colors in your photo. Shift, boost, or tone down all the colors in your image. Replace any color with any other. Mix the balance of the red, green, and blue color channels. Create beautiful black and white photography. Turn all the colors in your image into shades of a single color. Change all the colors in your image into shades of sepia. Quickly invert all the colors in your image. Wash out the colors of your photo. Make the finest details in your photo clearer. Add a touch of film grain. Adjustments powered by the graphics processor in your Mac. 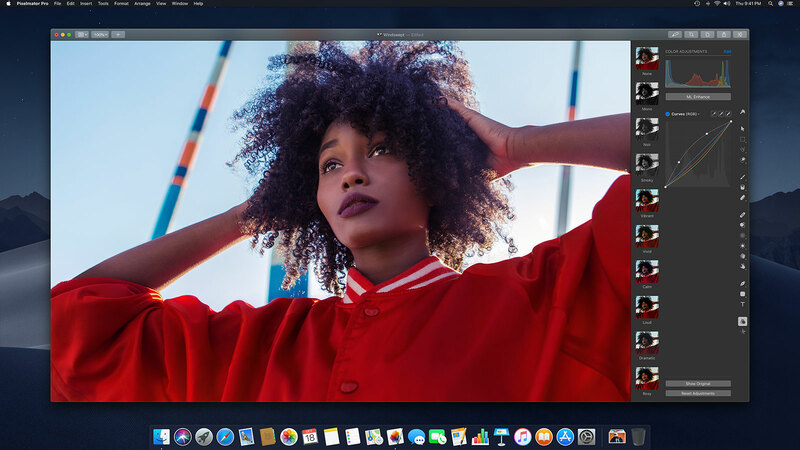 Every Pixelmator Pro adjustment is applied completely nondestructively over your original image. In fact, you can add multiple adjustments to the same image at the same time. Because they’re nondestructive, you can go back and fine-tune each adjustment, turn it off or back on at any time. And if you ever want to take a look at your original image, you can do that too. When you shoot RAW, your camera captures a great amount of detail that you can use to develop a photo with the perfect exposure and color settings. 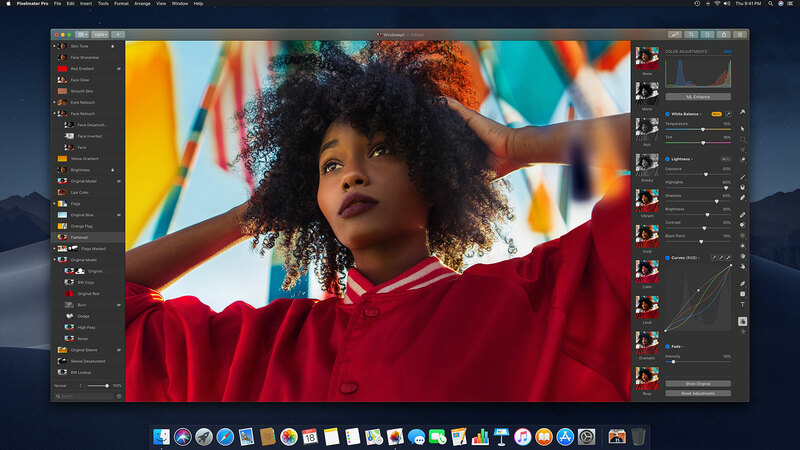 Pixelmator Pro includes full, native support for RAW images, so you can make the most of all the extended detail your camera can capture. Thanks to the RAW Layers feature, you can even edit multiple RAW images in a single composition. So no matter which color adjustment you apply to any of your RAW Layers, every adjustment works directly and non-destructively with your RAW file. Add and edit multiple RAW images as layers in a single composition. Every color adjustment works directly and nondestructively with your RAW file. Pixelmator Pro supports RAW files from hundreds of the most popular digital cameras. With so many incredible color adjustments and so many ways to combine them, the creative possibilities are endless. You can easily create authentic analog film looks, beautiful vintage filters, striking black-and-whites, or your own personal combinations to suit your style and workflow. And with the new Recipes feature, you can now save the combinations you create, use them in any of your images, and easily share Recipes with others. Combine any number of adjustments in any way you want. To share a Recipe, just drag and drop it from your Favorites onto your Desktop, and send it to anyone you want. Importing Recipes is just as easy — simply open the Recipe file or drag and drop it into Pixelmator Pro. The Pixelmator Pro color adjustments have been meticulously refined to deliver unmatched color quality and image clarity. Even if you make extreme color changes to your image, Pixelmator Pro uses advanced image processing to reduce posterization artifacts and keep the colors in your shot smooth and natural. Pixelmator Pro features a beautiful Live Histogram that instantly updates when you adjust colors, so you can track the changes to your photo as you make them. Use Lightness to perfect the lighting in your shots. Lift the shadows and pull in highlights to reveal hidden detail. Adjust Brightness to enhance photos that are a little too bright or too dark. Increase contrast to make the colors, textures, and subjects in your shots stand out. And with the machine learning-powered Auto Lightness, you can make photos more compelling and eye-catching with just a click. Use the machine learning-powered Auto Lightness to perfect the exposure, highlights, shadows, brightness, contrast, and even black point of a photo automatically and make it more compelling and eye-catching. Levels is a great adjustment for almost any photo as it’s designed to be both versatile and easy to use. So you can quickly improve the most important aspects of a photo, like the brightness, contrast, and colors, all in one place. The Curves adjustment is one of the most powerful in all of image editing, letting you adjust almost every aspect of the lighting and colors in your shots with an incredible level of depth and precision. The Curves adjustment features 5 channels that you can edit — RGB, Luminance, Red, Green, and Blue — and each one lets you edit your image in a different way. RGB lets you adjust all the colors that make up every photo together. Luminance adds a way to improve lighting without changing the perceived saturation of colors. And the Red, Green, and Blue channels let you individually edit each of the colors that make up digital images. The Luminance channel adds a more sophisticated way to enhance brightness and contrast based on how the eye perceives light. To the human eye, shades of green appear brighter than shades of red, and reds look brighter than blues. When you adjust Luminance, these differences are taken into account to carefully preserve the look of the colors in your image. Automatically balance colors by simply picking an area in your image using the eyedroppers. Each of the Red, Green, and Blue Curves channels are edited for you to make sure the color you pick is turned into pure black, white, or gray, while balancing the rest of the colors in your image. Auto Contrast and Auto Color automatically enhance your photo to make it more vivid and vibrant. Auto Contrast adjusts the Luminance channel to improve lighting. And Auto Color adjusts each of the Red, Green, and Blue channels to improve colors. They’re a great starting point, but you can always add any finishing touches yourself as the changes appear right in the Curves adjustment. Easily adjust precise color ranges. The Colors adjustment lets you easily adjust precise color ranges in your image, like the blues, yellows, or greens, without affecting any of the others. It features 8 individual color ranges divided according to the color spectrum. And above each color range, you’ll see a handy histogram that shows you just how much of that particular color is in your image. So you can bump up the blues to make a sky stand out, saturate the greens to make nature shots more lush, or pick out and adjust any other color in your image. Colors are divided into 8 color ranges according to the color spectrum — Red, Orange, Yellow, Green, Cyan, Blue, Violet, and Magenta, each of which you can edit individually and adjust at any time. A special histogram shows you the exact amount of color your image contains in each of the 8 color ranges. So you can adjust colors knowing just how much of an impact your changes will have. Change the hue of your chosen color, saturate or desaturate it, and make it lighter or darker. 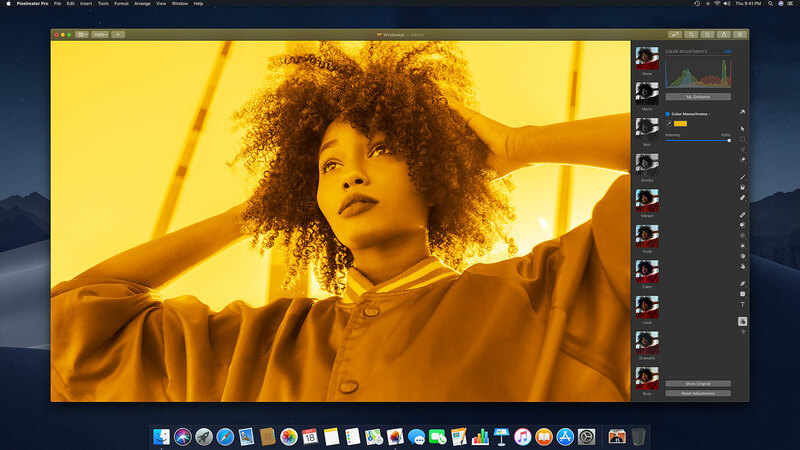 Quickly change the mood of your image by making all the colors warmer or cooler, or use the machine learning-powered Auto White Balance to automatically fix white balance in shots with unwanted color casts. If a photo is too warm, too cool, or has an unwanted tint, the machine learning-powered Auto White Balance detects any objects in the image — for example people, trees, or a sky — and adjusts the white balance to remove any color casts. Automatically get perfect white balance by simply clicking a part of your image that should be a neutral gray. Change the balance of all the colors in your photo by adjusting the intensity of red, green, blue, cyan, magenta, and yellow. Individually balance colors in the shadows, midtones, and highlights of a shot to change its feel, emphasize contrasts between colors, or add a unique style to a photo. Shift all the colors in your image along the color spectrum, make colors richer and more brilliant, or adjust their vibrancy. The Hue & Saturation adjustment also features an Auto button that lets you make photos more vivid and vibrant using the power of breakthrough machine learning. Auto Hue & Saturation makes photos more vivid and vibrant by using machine learning to adjust hue and saturation. Saturation and Vibrance give you two ways to saturate and desaturate all the colors of an image. Saturation makes every color more vivid equally, while Vibrancy focuses on the more muted areas, leaving colors that are already saturated alone – this works really well for boosting colors in portrait shots as it preserves natural-looking skin tones. Replace any color in your image with any other color. Use the Replace Color adjustment to replace any color in your image with any other. You can pick both the color you want to replace and its replacement in any way like. For example, using the built-in Color Picker to pick a color directly from your image, or using the native Colors window. Pick the color you want to replace and its replacement in any way you like. Use the built-in Color Picker to pick colors right from your image. Or open up the Colors window to choose colors using the color wheel, enter exact RGB codes, and even select from colors you’ve saved in your swatches. Mix the balance of the red, green, and blue color channels to create intense color effects in your images. Create beautiful black and white photography, even from your color photos. Featuring a range of options that help bring out the contrasts, textures, lighting, and shadows in your black-and-whites, the Black & White adjustment lets you create beautiful black and white photography, even from your color photos. Individually adjust how light or dark every color in your original image appears in your black-and-white. Blend the Black & White adjustment with your original shot using Intensity. Easily adjust brightness and contrast using Tone and Constant. Use the Color Monochrome effect to turn all the colors in your image into shades of a single color. You can also blend the new monochrome with your original image using Intensity. Use Intensity to blend your original image with your new monochrome. Instantly give your photo an aged, vintage look by changing all the colors into shades of sepia. The Invert adjustment instantly inverts all the colors in your image in their opposite colors. Wash out the contrasts in your photo. Wash out the contrasts in your photo to give it a faded look. The Sharpen adjustment gives you a way to quickly make all the details in your photo clearer by increasing overall sharpness. The Sharpen adjustment combines an advanced sharpening technique together with an edge detection algorithm. 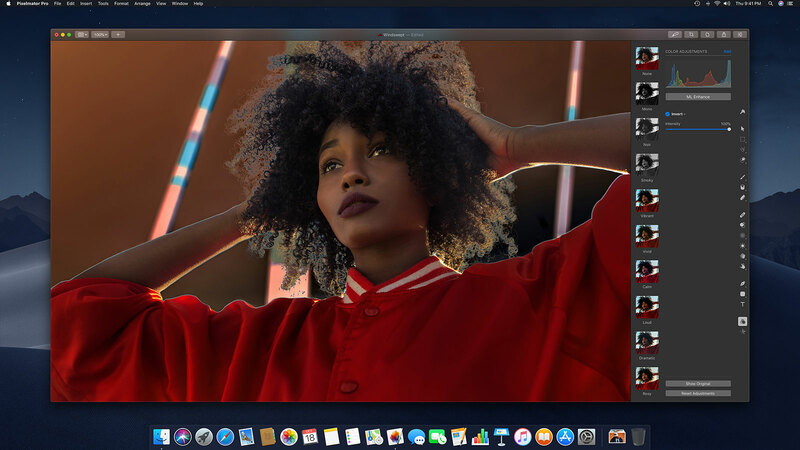 Using this algorithm, Pixelmator Pro increases contrast in very precise areas in your image, giving you much more naturally sharpened details. Add a touch of grain to emulate the look of analog film in your digital photos. 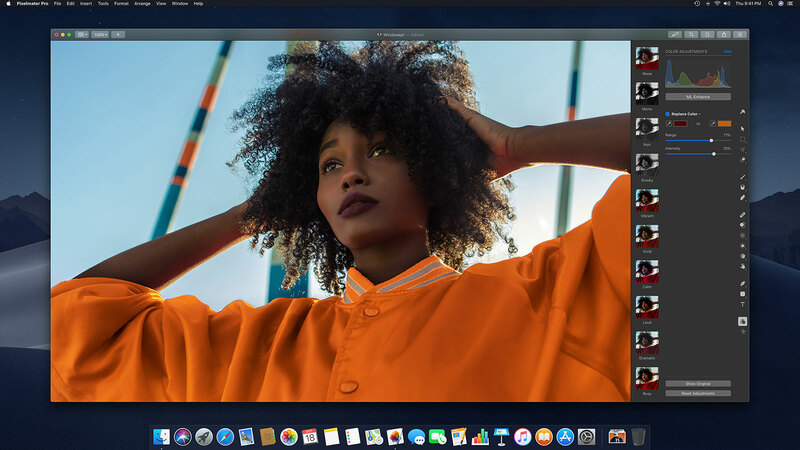 Pixelmator Pro delivers blistering fast adjustments, since it takes full advantage of the graphics processor in your Mac by leveraging cutting-edge graphics technologies like Metal and Core Image.